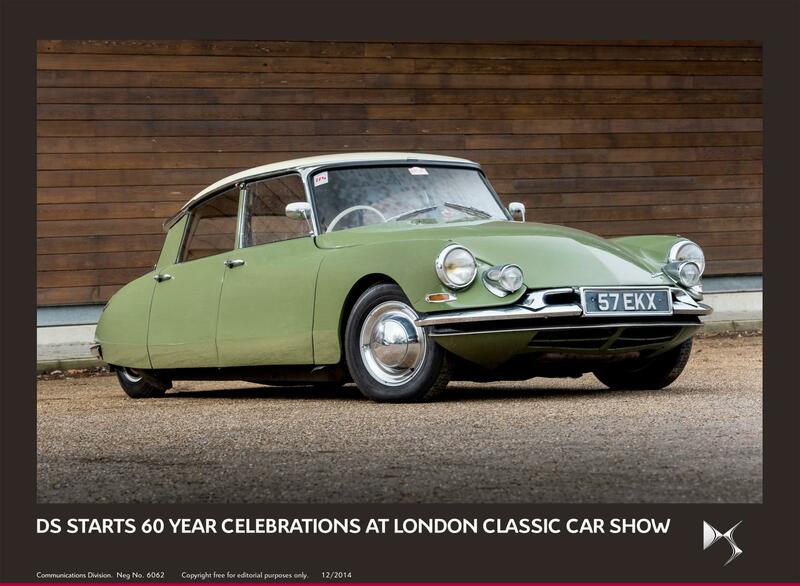 Launched in 1955, the original DS will be 60 years young in 2015. To kick off a full year of celebrations, the newly established DS premium brand will be showcasing selected models from six decades of innovation and cutting-edge design at the first ever London Classic Car Show. The London Classic Car Show takes place at the ExCeL International Exhibition Centre in London’s Docklands, from 8 - 11 January 2015. Two classic DS models will be on display on the DS show stand – a 1972 DS21 Prestige and an exceptionally rare 1966 DS21 Décapotable with coachwork by Henri Chapron. The multi-award-winning DS 3 – shown in Ultra Prestige form – and a flagship DS 5 Hybrid4 will represent the current range. In addition to the static display, DS models will also make a number of star appearances on ‘The Grand Avenue’ – a unique motoring catwalk allowing the most iconic cars to be fired up and driven around the show. The DS cars will be a 1967 Citroën ID21 Safari; a 1972 DS Group V rally prototype; our very own 1961 ID19 (Reg. No. 57 EKX, newly added to the press fleet for 2015); and the DS 5 used by President Hollande at his inauguration. The organisers of the new London Classic Car Show aim to build an event that will put London back on the classic car map, rivalling the top shows in Paris and Essen, by bringing together themes that have shaped the motor industry's incredible past. DS has sold over 500,000 cars worldwide since the launch of DS 3 in 2010, with the multi-award winning DS 3 alone having sold over 320,000 examples. In the UK, DS has sold almost 95,000 vehicles, with DS 3 sales in excess of 77,000 since launch. 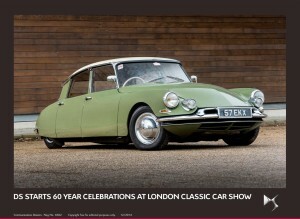 For further information on the London Classic Car Show, visit: http://www.thelondonclassiccarshow.co.uk/.